Its time for testing your chat friends who are online. Facebook has announced that its new chat feature will test whether friends who are online in chat window are actually using "Web" or "Mobile". It is a new step in the messaging by Facebook. Actually, the chat window will display whether any friend is online and will be chatting from web or using mobile. These two words, "Web" or "Mobile" will be displayed as per the online friends in the chat window according to their chatting browser. Here in the image, there is a friend who is online and is using "Web". The feature that gives Facebook users the information about what type of device their friends are using is actually a throwback to the older days of messaging services. Earlier chat window displayed the small icon of "mobile" which was understood that the representing icon besides friend's name displayed if he or she is using mobile. But now with the test of new chat feature, words displayed besides online friends will be marked as from which device they will be chatting. 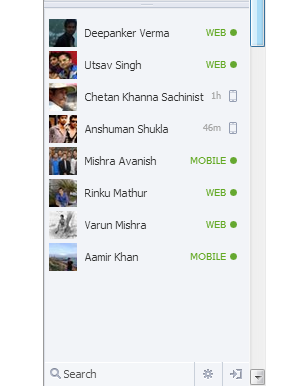 It is a cool feature for understanding the device your friends are using while chatting. The device that you are using will be displayed in their chat window either "Web" or "Mobile". Know more about "Chatting Tricks". If you are lucky enough to know about your friends who are online and displayed whether they are using their "Web" or "mobile" device, then let me know via comments. I still don't have this feature while all my friends do, so how do i get this feature? I'm using mobile while chatting with my friends but instead "mobile" its display as "web" besides my name. How can i get that feature?? I dont have it yet. I want it.